Have unusual or heavy loads that are not suitable for a traditional turntable stretch wrapper? Wrap your long, narrow products with this customizable rotary arm stretch wrap machine. The Wulftec WCRT-CRW offers leading packaging technology designed for demanding, high-volume packaging lines – all with a rugged three-legged design that’s built for performance. Available features include a user-friendly touch screen, industrial-strength precision ring bearing, pneumatically-operated cut and wipe-on system, timed impulse heat control and revolutionary drop away clamp. 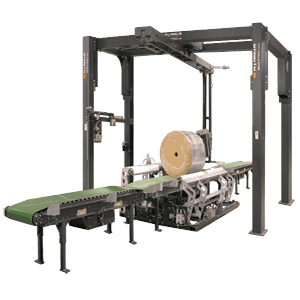 To learn more about the Wulftec WCRT-CRW Automatic Rotary Arm Cocoon Roll Stretch Wrapper, give us a call at (609) 337-3641 or request a quote online. Our factory certified technicians are available 24/7 to answer your questions, address your concerns or jump on a plane to deliver on-site support. No matter when downtime strikes, you can count on Hughes to be there with the maintenance and support you need. Reach out to request assistance with installation, maintenance or emergency repairs.